An Economic Burden. Preliminary estimates are that the Rain Tax will cost the average homeowner between $3 and $8.40 (current Downers Grove charge) per month. This fee will be applied to the monthly water bill along with our garbage fee and leaf fee. Businesses could pay hundreds of dollars per month more based on the square footage of impervious surfaces they have. (See "Calculate Your Potential Rain Tax" below.) The Rain Tax could drain between $3 million to $8 million from our still struggling local economy. Unnecessary. Elgin citizens already pay a sewer maintenance fee on their water bill therefore we already have the funding mechanisms in place to implement sewer separation at its current rate. The EPA approves of Elgin's current sewer separation activities according to City Staff. City Engineering is capacity limited and cannot handle an accelerated rate of sewer separation. Also, it would be too disruptive to daily life in Elgin. Administrative nightmare. How will the City measure every rooftop and impervious surface in the City of Elgin to meter out the Rain Tax fairly? How much will that effort cost? Inequitable. Because this is legally a fee, it will be charged to all residences and businesses, as well as churches, schools, and not-for-profit owned properties. No write off. The Rain Tax as a fee cannot be deducted from your Federal taxes. Unfair. Most storm water doesn't end up in the city sewers. The majority of downspouts drain onto a homeowner’s property. Permanent. Once a tax or fee is established, it is nearly impossible to undo. Slush Fund. 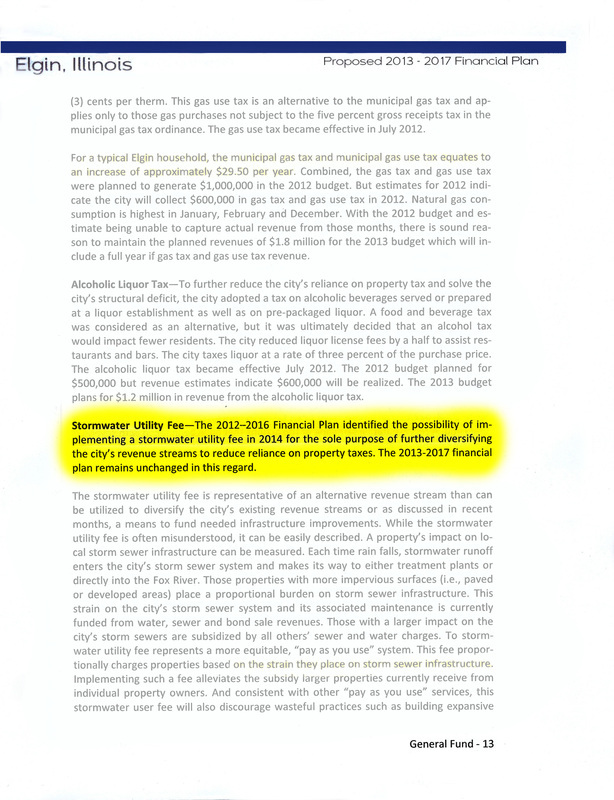 The Rain Tax was introduced in the City's 2012 five-year financial plan, and was to serve solely as a new source of revenue, without any connection to the sewers. Council budget talks last fall indicated that money from the Rain Tax may simply go into the General Fund where it can be spent on anything. Another Revenue Diversification fee gone wild! Opposing the Rain Tax is NOT the same as opposing the repair and separation of our sewers. Everyone, including Elgin OCTAVE, wants the Fox River to be clean. But did you know that without the Rain Tax, we have already managed to spend $25 million to separate our sewers and we are spending more than $4 million this year. If the EPA should require the City of Elgin to accelerate the pace at which we are separating our storm sewers from our sanitary sewers, then we should reprioritize funds being spent on less important projects to being spent on our sewers--NOT raise taxes. Join us and Stop the Rain Tax! To calculate your potential Rain Tax, first you need to understand the "ERU" which is an Equivalent Residential Unit. The ERU is a measurement of the amount of impervious square footage that a typical residence contains which is calculated to be 3000 square feet based upon the aggregate of a driveway, garage roof, house roof, and miscellaneous paving. Every property will be charged monthly based upon how many ERU's it has. Residential: Based upon the low end figure Strand Associates provided to the Council last October, one ERU for a typical residential property will cost $3 per month. On the high end, Downer's Grove has a storm water utility tax and charges $8.40 per ERU per month. That translates to a fee from $36 to $100.80 annually for homeowners. Commercial: As an example, if you own a piece of property with impervious surface totaling 9000 square feet, you divide that by 3000, resulting in 3 ERU's. Using from $3 to $8.40 per ERU above, it could cost from $108 to $302.40 annually for a business, not for profit, church, etc.